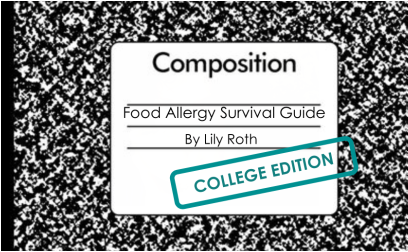 Our food allergy survival guide is a free resource for high school students, college students, parents of food allergic students, and college guidance counselors. Food allergies are hard to manage but through the adolescent and to college years, they can pose even more issues for food allergic teens and their families. We hope you will find these guides helpful no matter how food allergies affect you; whether you are a student with food allergies, a food allergy parent, or a college guidance counselor. Download Our PDF College Guide!!! Going on a trip where you won't have internet? Hate reading on a screen? Our college guide is now available in PDF format. Click below to download today!!! We want to hear them all! Please leave them below! Thanks! Please write your question, comment or concern here. If it doesn't fit, please feel free to email us at fasurvivalguidecollegeedition@gmail.com. Thanks! If you would like a response, please provide us with your email.